Get to know the member companies and individuals who make up the i2Coalition. Every month, i2Coalition Communications Manager Dakota Graves sits down with the leaders of Internet infrastructure companies to discuss their businesses, the Internet infrastructure industry, policy work, and more. Dakota: Hi Allison, thanks for joining me today for this month’s i2Coalition Member Spotlight. Why don’t we start with a brief overview of WebHostingTalk? Allison: WebHostingTalk is the largest and longest-running hosting related community forum out there, starting in 2000 and now with more than 1.5 million threads. That’s a lot of web hosting talk! Dakota: You also co-founded the WHIR. Dakota: Please give us a little history of the WHIR. Allison: The WHIR was founded in 2001. It was my co-founder Stephen Mayhew’s idea and I thought it was a smart one. He saw a need for a trade publication, as a resource for the industry itself. There were loads of online resources and directories for web hosting customers, but there wasn’t really anything for the actual hosting companies themselves. A resource they could turn to and learn how to build their business, where can they go to find, you know, technology vendors and partners. And so the WHIR was born. Rackspace was our first customer. Dakota: The WHIR primarily did resource articles. Allison: Yes, we covered industry news and had how-to evergreen content and information about hosting and reselling hosting services. The WHIR quickly became both for and about the hosting industry. We were attracting both the industry and buyers of hosting services to our website. I think that mix of audiences made the site as successful as it was. We were able to bring those groups together, connecting customers with hosting companies, and hosting companies with vendors. It was a news website, but we also had a directory of hosting companies, so if somebody wanted to find a host, they could do that too. Dakota: What made those two unique? There were a lot of resource websites out there, but those two became the two that were deemed the community’s goto sites. What made those two standout from the rest? Allison: I think the fact that both were owned by neutral organizations, being real media companies. These weren’t hosting review sites that were actually set up by hosting companies unbeknownst to the website visitor. We truly were a group of journalists. I came out of journalism school, we ended up hiring some people I went to school with. Adam Eisner was our first official editor, followed by Liam Eagle. When you ask what set us apart or made us as successful as we were, I do think it was the fact that we truly were a neutral publishing group. Dakota: There were several forums that I’m aware of them. I’m sure there were even more. What ended up making WebHostingTalk the strongest option available? Allison: I think it’s power in numbers. With so many members and so many threads, Google loves the site and we get a ton of organic traffic every day, coupled with repeat visits from loyal community members. I also keep coming back to the fact that WHT is owned by a neutral media company and not an individual or service provider company, which may affect how reliable and trustworthy the information is perceived to be. There are so many “resources” out there that are actually owned and operated by other service providers or resellers with ulterior motives. Dakota: The sheer number of articles, comments, and threads have made that a resource whose value cannot be overstated for the community. That is huge. Dakota: That’s been going for a long time. Christian posts there consistently, keeping everybody there up to date. It’s a great way for people to keep track of what the kind of work we’re doing, but more importantly to kind of issues that are facing the industry. When did you first hear about the i2Coalition? Allison: When it was born, we wrote about it on the WHIR because we knew Christian from ServInt at the time and David Snead was an avid WHIR blogger and contributor to the magazine. We were probably one of the first media outlets to report on it! Dakota: You’ve basically been here since the beginning and we’ve always had a close relationship with WebHostingTalk. 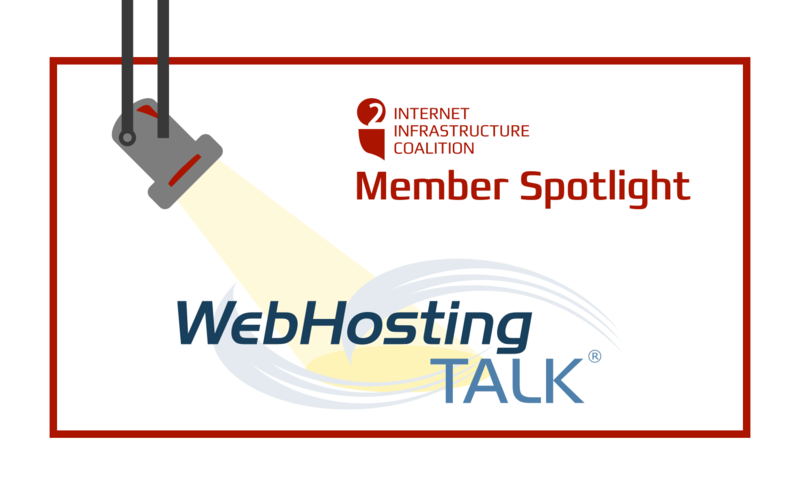 Allison: I think it’s a great fit too, because both the i2Coalition and WebHostingTalk are so community focused. Dakota: How long has the moderation team been there, has it always been the same moderation team? Allison: That’s a good question. The various moderators have, like the hosting industry, come and gone over the years. I know the folks that are moderating now and have been there for some time. What I love about WHT is that there is a divide between the commercial side of the house and the community side of the house. If we have a big customer who doesn’t play by the rules and they ended up getting themselves in trouble with the moderators, I can’t do anything to rectify the situation “just because” they’re advertising with me. I respect that. It’s very church and state. These moderators work extremely hard to keep the community honest and untouched by commercial influence, and we wouldn’t be where we are without them. This speaks volumes to their passion and their dedication to the community. They keep the site in good standing and the community healthy. They put in a tremendous amount of time and effort at creating the best experience for the visitors. WHT definitely wouldn’t be what it is today without them keeping the site running smoothly and the community well served. Dakota: Why did you decide to join the i2Coalition? Allison: I’ve been very impressed with the work the i2Coalition does. I think it is now more important than ever that the Internet services community has a resource for information about navigating policy and interacting with law enforcement. This is important stuff. Entrepreneurs are trying to provide good services, but they need a venue where they can learn about the policy side of things, what their rights are, their responsibilities, etc. It’s taking the community to a more sophisticated level. It’s where the grownups of the hosting industry can put their heads together, team up, and learn from each other. Dakota: That’s a really great way of putting it. Many of the issues we work on can be difficult to explain but affect the consumer in ways that they are not aware of. Dakota: What issues will you be working with us on? Will you be joining any of the working groups? Allison: I am part of the Gender Diversity & Equity Initiative. I’ve been a somewhat active member for some time now. I’m happy to provide support to that group, especially in the past at face to face events. It’s just great to see some of the leaders in the industry giving some attention this topic and trying to foster awareness. I think it’s an important working group that I can contribute to through my contacts. I love getting people together. It’s something I’m known for and I love when people turn to me for an introduction because I know someone they’d like to know better. Dakota: That’s really great. Last but certainly not least, congratulations. The i2Coalition Board and leadership announced earlier this year that you and Stephen would be receiving the annual Ron Yokubaitis Internet Community Leadership Award. We give this to members of the industry who have successfully helped protect and grow the industry through different means. You and Stephen would be receiving it specifically for your work with the WHIR. Congratulations once again on that. Allison: Thank you. We were very honored and touched to receive to receive this award. We were not expecting it. I love that Stephen and I are being acknowledged, but we really could not have done it without the team behind the WHIR. I think that’s something that Stephen does very well. He puts really good teams of people together. Secondly, the industry. Without the industry — without all of you reading this — it would not have worked. It’s great to see that we did serve a need and it was as well received as it was. Dakota: Thank you for sitting and talking with me today. Allison: Oh my pleasure. Thank you for the interview.